Hello! Today I have Danglefoot Nail Polish topper 'Merlin' to show you. When my bottle arrived in the post, I was wearing Fair Maiden Polish 'Starry Night', a deep navy holographic with golden flakes (swatched here). I immediately thought that they'd be perfect together, as a sort of night sky look. Read on to see how it went! 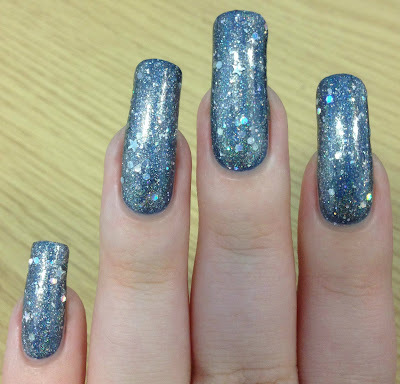 'Merlin' is a holographic topper with added silver holographic hexes and stars. It is very densely packed, so you get a very generous amount out on each dip of the brush. You might actually be able to get this opaque on it's own. The glitter spreads out evenly, and I didn't have any trouble getting out the stars. Below is one coat with topcoat over 'Starry Night'. What do you think? I didn't realise just quite how packed this was with glitter, and painted on a fairly thick coat! I've gone for quite the chunky blingy look. I do love it, but think next time I'll go for a thinner, more gentle application. I also think it would work really well sponged on as part of a galaxy nail design. Danglefoot Nail Polish's etsy store (here) is currently closed until around September, but you can keep up with updates on Instagram here. Ohhh I really like this! I like this topper and i think it would also look great on a dark blue! This is a gorgeous topper! Really does look like it would also look great on it's own. I love that glitter! I like the way dense glitters like this one change the color of the base.